What's the best dual-core handset? How does the Atrix stack up against the Samsung Galaxy S2 and LG Optimus 3D? Two of the highlights of this year's Mobile World Congress were the powerful Samsung Galaxy S2 (Galaxy S II) and the futuristic LG Optimus 3D. But how do they compare to the spec-heavy Motorola Atrix, announced at CES in January? All three are super smartphones with dual-core ARM processors as you'll see. All three handsets also impress with cutting-edge screen technology, although they couldn't be more different in their execution. All three handsets run Android, albeit different versions. Samsung's phone uses Android 2.3 (Gingerbread), customised with the TouchWiz 4.0 UI overlay and Swype text input. Samsung has a few notable extras to the software on the Galaxy S2. For starters, there are now four 'hubs' - the Reader's Hub, the Social Hub, the Games Hub and the Music Hub. The Galaxy S2 also features enhanced conferencing and connectivity services from Cisco, a comprehensive implementation of Microsoft Exchange ActiveSync and secure remote device management from Sybase. In contrast, the LG Optimus 3D will launch with Android 2.2, which will be upgradeable to 2.3 at some point in the future. LG has obviously had more time to modify this version of Android to work with its unique 3D UI. A dedicated '3D' Hot Key on the side of the handset can activate one of five 3D UIs, including: Gallery, Camera, Game & Apps, YouTube 3D and 3D Guide. All three handsets incorporate the latest in dual-core mobile processing - all based on the ARM Cortex-A9 design. Inside the S2, you'll find an Exynos processor (formerly 'Orion'), rated at 1GHz. This is the dual-core follow-up to the successful single-core Hummingbird chip that appeared in the original Galaxy. The Motorola Atrix has a 1GHz Nvidia Tegra 2 processor, offering the ability to drive larger HD panels from the handset. 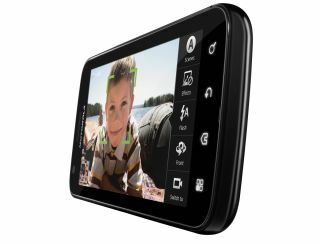 The Optimus 3D, meanwhile, boasts a 1GHz dual-Core, dual-channel OMAP4 processor supplied by Texas Instruments. LG claims that it offers "significant performance benefits as a result of the faster transfer of data between the dual-core and dual-memory". "This enables users to browse web pages, multitask between programs, play games at a higher frame rate and enjoy movies more smoothly than ever before," Samsung adds. The Galaxy S2 features a touch-sensitive Super AMOLED Plus display with Gorilla Glass for added toughness and scratch-resistance. Quoted as a 4.3-inch screen, it actually measures 4.27 inches across the diagonal and has a resolution of 480 x 800 pixels. The touch-sensitive 3D LCD screen on the Optimus 3D is the same size and resolution. Although the LCD technology will be no match for the vibrancy of the Super AMOLED Plus display on the Galaxy S2. That said, this autostereoscopic LCD is a world's first on a mobile phone, supporting 3D viewing without glasses. The Motorola Atrix ups the ante in terms of pixels, with a 540 x 960 qHD display. It is, however, smaller at 4-inches across. The Galaxy S2 wins the internal storage battle as it comes in either 16GB or 32GB models. The Moto Atrix only has a 16GB capacity. In comparison, the Optimus 3D only has 8GB-worth of storage. Headlining the Samsung Galaxy S2 is an 8.0 Megapixel camera (3264 x 2448 pixels) with extras that include: autofocus, LED flash, geo-tagging, touch focus functionality, face/smile detection, image stabilisation and 1080p video capture. On the front face, you'll also find a 2MP camera for video calls. Or self-portraits. The Motorola Atrix has a 5 Megapixel snapper on the back with dual LED flash. It's 720p capable. The camera on the front is a 0.3 Megapixel unit. Again there's autofocus, geotagging, white balance and other effects. It's hard to compare both of these setups against the LG Optimus 3D, which features dual 5MP cameras with an LED flash between them. It might boast fewer options (autofocus and geo-tagging), but the twin lenses are capable of taking stereoscopic photos and videos (720p only) or capturing 1080p video in 2D. LG has also added a front-facing camera, probably a 1.3MP or 2MP model (unconfirmed). In terms of connectivity, all three phones are well-specced. The Samsung Galaxy S2 and Motorola Atrix 2 incorporate 3G/HSDPA and HSPA+ at speeds up to 21Mbps where supported. Both have got every band of Wi-Fi covered too and can handle 802.11a/b/g/n. Both handsets also have Bluetooth 3.0+HS. Based on 802.11 protocols, it's capable of enhanced data speeds up to 24Mbps. The wireless options on LG's Optimus 3D are fairly similar. They include a tasty mix of 3G/HSDPA and HSPA+, a triple play of 802.11b/g/n Wi-Fi plus Bluetooth 3.0 with A2DP. Not quite as good as the Galaxy S2, but still far from shabby. All three phones also feature microUSB jacks and HDMI ports for outputting whatever is on the mobile display to an HD telly. The Samsung and LG handsets also include stereo FM radios (with RDS), although it doesn't seem to be enabled on the Motorola Atrix. At this level, you'd expect most smartphones to feature GPS/A-GPS, a built-in gyroscope, digital compass, plus screen-flipping accelerometer, proximity and light sensors. And all three hit the spot here. The Galaxy S2 is a neatly designed, beautiful-looking handset that measures 125.3 x 66.1 x 8.49mm. If you know your phones, then you'll appreciate the fact that 8.49mm is slimmer than the Sony Ericsson Xperia Arc, which nabbed the 'world's thinnest smartphone' crown from Apple's iPhone 4. LG's phone is visibly chunkier, measuring 128.8 x 68.0 x 11.9mm. It also has more of a plastic gut than the new Galaxy S2. Compare the two and Optimus 3D's phone is 168g, while Samsung's' handset is a mere 116g. The Atrix is heavier at 135g, while the other key measurements come in at 117.8 x 63.5 x 10.1 mm. So, in terms of length, it's smaller (as it has a smaller screen), but otherwise it sits right in the middle. It's not surprising the LG is the biggest considering it's dual cameras for 3D. Neither manufacturer has supplied any talk and standby time stats, but the Samsung Galaxy S2 boasts a 1650 mAh battery, while LG's 3D-enabled Optimus makes do with a 1500mAH Li-Ion cell. The Atrix is the winner of the battery contest though - it has an awesome 1930 mAh battery.